This is great event and a must do. 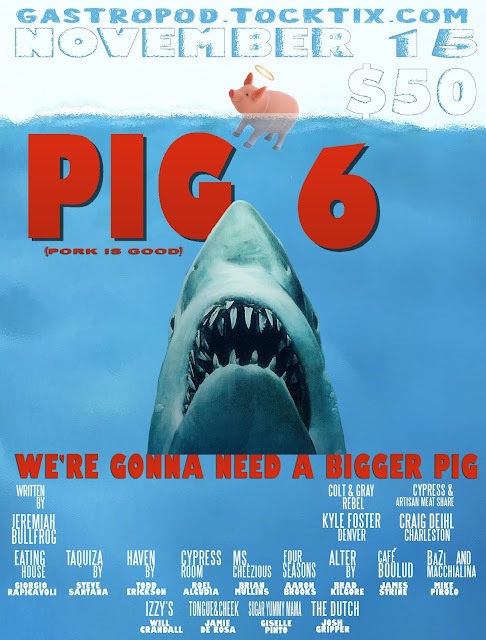 P.I.G. (Pork Is Good), now in its sixth year, is the brainchild of celebrity chef and organizer Chef Jeremiah of gastroPod. The event is a daylong celebration of all things Pork, with past editions featuring chicharrón, pork pasta, Chinese-style drunken pig, bacon sweet potato pie and other mouth-watering dishes created by South Florida’s most exciting culinary talent. In addition to Chef Jeremiah, this year’s event features the minds behind some of South Florida’s most acclaimed kitchens: Steve Santana (Taquiza), Todd Erickson (Haven), Roel Alcudia (Cypress Room), Brian Mullins (Ms. Cheezious), Aaron Brooks (Four Seasons), Brad Kilgore (Alter), James Strine (Café Boulud) and Mike Pirolo (Bazi and Macchialina).